Shorts walks to Downtown, the Lake Michigan Shore and the Kid's Corner Playground at 103 Clinton St.
Weekly rentals only beginning on Fridays. Pets Not Permitted but Owner Has a Dog. Coastal Farmhouse has charm to spare and a location that can't be beat! 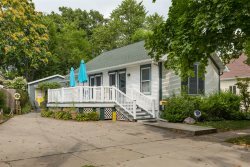 Close to everything in South Haven, you can see the lake a block away from the front yard, Kid's Corner playground and ball field are also just a block away and its a quick stroll to downtown shops and dining. And, of course, ice cream. This home is best described as a modern farmhouse with a coastal feel. Recent updates include fresh paint, new plank floors, all new furnishings, and much more. The main floor consists of a darling kitchen which is open to a dining room with seating for 10 and to a living room with comfy seating. There is a full bath and a bedroom on the main floor, perfect for the family members who don't want to climb the stairs. There is a small porch on the front of the home for sipping morning coffee, reading a good book or just taking in the view of Lake Michigan. The upper level has 3 large bedrooms and a full bath. Full laundry is available in the basement. The outdoor space has grilling, outdoor dining, and a fire pit with chairs for evening campfires. You are so close to the beach though, make sure to see the sunset before you settle in for the evening. Bedroom 2. Upper Level. King. Bedroom 4. Upper Level. Full and Twin Trundle.